If you live in a rental apartment or own a house, chances are, you will need to clean your floors regularly to maintain an appealing appearance. Flooring, however, is one aspect of home cleaning that never seems to be completely cleaned. This concept is particularly true for tiled flooring. It can become faded, lose its luster, and become dirty after frequent use. 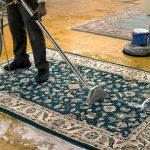 If you are looking to hire a reliable tile and grout cleaning company, Reilly’s Oriental Rug Cleaning can help! We provide deep tile and grout cleaning services for many clients in Northern New Jersey. Backsplashes, countertops, sunrooms, hallways, entryways, foyers, kitchen floors, and bathroom floors are some of the most common areas in one’s home that feature tiled flooring. Over time, these surfaces can lose their shine and luster. In addition, mopping and scrubbing do not seem to restore the tiles to a better state. This can happen because grout is porous and tends to absorb all the dirt and debris on it. With that in mind, mopping only removes the top layer of soil, but fail to tackle the embedded dirt that causes the grout to become dull. Professional tile and grout cleaning services are designed to restore grout and tiles, as well as achieve a thorough clean by eliminating severe discoloration. It is also possible to re-color the grout through these services. What are the Benefits of Tile and Grout Cleaning Services? When you hire us, our team will first pre-treat the affected tiles to loosen up topical residue, contaminates, grease, and accumulated soil. You can enjoy peace of mind that these solutions do not produce any harmful fumes. The next step involves agitating the tiles’ surfaces and grout lines with special serrated bristles. After that, our tile and grout cleaning team will perform a splash-free and high-pressure hot water rinse. We complete the job with a speedy drying process, conduct a final inspection, and apply protective coatings to prevent future staining. Every client’s case is different; it is recommended that you consult with our team to allow us to develop a tailored tile and grout cleaning program for you. Since our inception in 1918, Reilly’s Oriental Rug Cleaning has been providing top-notch tile and grout cleaning services for families and business owners throughout Northern New Jersey. With over 100 years of experience in this industry, we can clean and restore your tiles to excellent conditions. All of our tile and grout cleaning jobs are performed by highly trained and certified operators. Coupled with competitively priced cleaning solutions and unparalleled customer service, you can expect to get nothing but the best from us. Are you interested in using Reilly’s Rug and Carpet Cleaning’s tile and grout cleaning services? Do not hesitate to call 201-445-0800 or email us at Info@RugClean.net for more inquiries.